I don't know what it is lately (maybe the cold weather + dry skin) but the more minimal I can make my look the better. 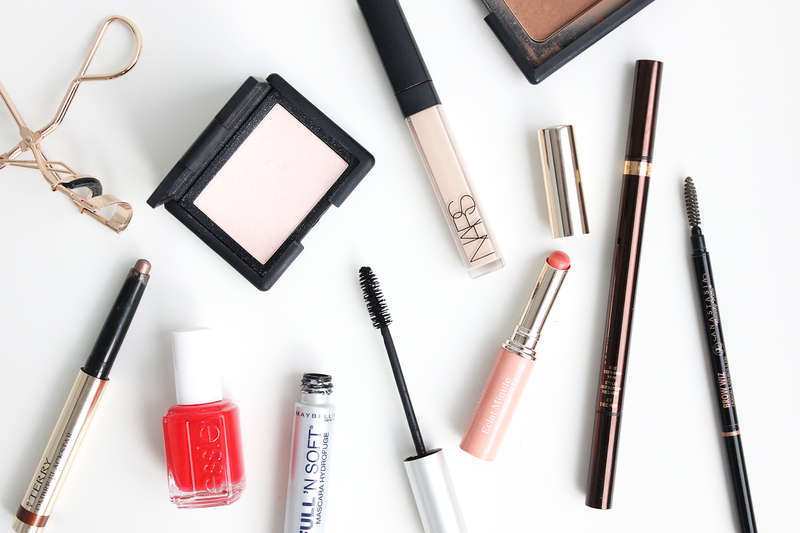 Right now I'm about products that are quick, easy to apply, and still leave me feeling polished. I have been skipping foundation all together and it makes for a far quicker morning when getting ready. I load up on moisturizer and pop on the NARS concealer where needed (usually under my eyes and on/around my nose). To give a bit of color to my face I add bronzer + blush (this new NARS one has a gorgeous shimmer/highlight to it and helps give the effect of super glowy skin). With my face done I then focus on my eyes. I fill in my brows with my Anastasia Brow Wiz, pop the By Terry Ombre Blackstar all over my lids (this is seriously one of those can't-live-without-it products - it's the creamiest, easy to apply formula which gives a smoked out effect in seconds), and then add a quick, thin line of liner to define my lashes. To finish off my eyes, I curl my lashes and then pop on a bit of mascara. The last step as I'm running out the door is to throw on this new balm from Clarins. It is super hydrating and adds just the perfect amount of coral color to compliment the brown smokey eye. Lastly - while I'm not painting my nails as part of my everyday routine I have been loving orangey/red shades to keep things bright and cheerful on cold winter days. Be sure to let me know in the comments below what your makeup routine is lately and the products you are loving! So glad you love it!! It is seriously the greatest eye shadow product! I need to restock my Nars concealer and ABH Brow Wiz!! Great picks! Both total necessity products for me!! Lovely pics :) and a great post too. Found your link on the #bbloggers tag and so glad I did, you have a gorgeous blog. The By Terry product is such a stunning shade. I always love hearing how people discover my blog :) thanks for stopping by! It took me a while to finally get the By Terry color (it often sells out) but it was definitely worth the wait! I love putting my bb cream as a base as opposed to a foundation. I guess it just feels a lot lighter! I need to find a good bb cream - I always see people rave about the Dior though. Which one do you use? I've been loving the Clinique balms recently too, perfect for a simple no-fuss lip option! They are definitely the easiest lip option! So perfect to throw in your bag! NARS Concealer is one of my go-to products - it's amazing! Definitely one of the best products I own from NARS! That shadow stick sounds great, I definitely love products that are easy to use. Sometimes powder eyeshadows are so finnicky to blend out and what not. That shade of polish is really lovely too! I heard so many rave reviews about the By Terry Ombre Blackstars that back in the fall I decided to take the plunge and snag one. I am SO happy I did. I keep adding them to my collection too, I just can't stop! LOVING the full and soft mascara now that I picked it up, such a fan of the curl and the long lashes that aren't clumping. Also, I love that you picked a red! the brighter the better, but I also want to try that blush shade of blush! So glad you love the Full N' Soft! !